This interesting combination of modern age and classic style is brought to you by Chad Los Banos. With this fixed blade, Chad combines the standard diagonal edge of the Japanese Kiridashi with a belly-curve edge towards the tip, thereby boosting its versatility to a huge extent. This innovative blade is made of 440C stainless steel, and the package comes complete with a Kydex sheath and ball chain. Tek-Lok compatible (not included). Blade length: 2 1/2″. Overall length: 6″. Weight: 2.5 oz. Made in China. This innovative piece by American designers Miltner/Adams offers extraordinary user safety. 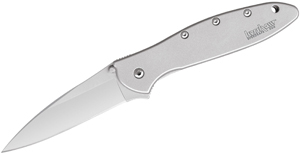 With its Top Grip construction, this knife is 100% safe in your hand, in any situation. The handle design allows the user to open their hand in order to grab or hold another object, without the risk of losing the knife. 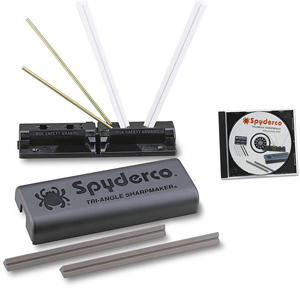 An extremely compact piece, ideal for a variety of tasks. The blade is made of 440C stainless steel, titanium coated. Includes a fiber-reinforced nylon sheath with belt clip. Blade length 2 1/2″. Overall length 5 1/8″. Weight 1.6 oz. Made in China. Elishewitz is one of the most popular knife designers anywhere and this combat fixed blade is an awesome achievement. Blackhawk is just the company to offer it up to the troops that need it. The design of this knife is awesome. SOG Microns have been a favorite key ring knife for years. 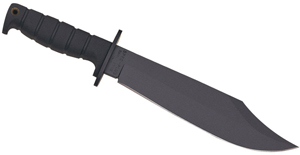 SOG just discontinued their standard model and released this tanto model. It’s a great knife– simple and effective and very well priced. We have found the nicest kitchen knife magnets for your kitchen cutlery! These are hand made in Texas by some master craftsmen. They use exotic hardwoods for these kitchen cutlery magnets with Mother of Pearl inlays on the spots where the magnet will work. The “rare earth” magnets are super strong. These kitchen knife magnets actually look nice in your kitchen! We carry three woods– Maple, Cherry and Wenge- a very dark, gorgeous wood that will fit any decor. We have them in two lengths– 5 inch which has five magnets and 7 inch with 7 magnets. We found these and liked them so much we wanted to offer them out to our customers. Have a look! This Boker Knife is a real beauty. We love Boker Knives’ Damascus products and carry all we can get, but this one adds the beauty of the Mokume process on the bolster. The Mokume process is a “marriage of metals” with nickel, brass and copper being layered and the result is really striking. The picture doesn’t do it justice as the layers are more pronounced to the eye. The blade is Devin Thomas damascus using Devin’s own “Raindrop” pattern. The handle is a beautiful exotic wood. Phew– this is a great, limited edition Boker pocketknife!